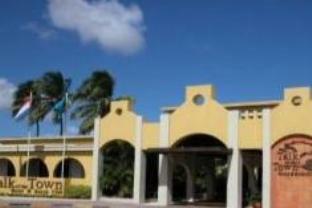 ﻿ Best Price on Talk of the Town Beach Hotel & Beach Club by GH Hoteles in Oranjestad + Reviews! This Aruba hotel features rooms with microwaves and refrigerators. The hotel is one miles from the Queen Beatrix International Airport and offers an outdoor pool and free WiFi in all areas. A cable TV and a private bathroom are standard to all rooms at the Talk of the Town & Beach Club by GH Hoteles. The rooms feature tropical décor and large airy windows. Guests at the Talk of the Town can dine at the pool-side restaurant, which is open all day or get a drink at the lobby bar. The hotel is within a 10-minute walk of Oranjestad, which features shopping and dining. The hotel is within a 10-minute drive of the Caribbean Sea. The location is good. Just 3 minutes from the Airport. Just 15 minutes to get all the way to the North side and 25 minutes to the South side of Aruba. Dutch Staff at the bar is not very helpful. Refuses to borrow us cutleries. Very weird!! The staff was friendly and hospitable. I didn't like the free breakfast. It was outdoors and there were insects around while I ate. I didn't know how to turn off the air conditioning. I didn't see an on or off switch. There were a couple of holes in the bed sheet. It wasn't worth the price charged, but it's very close to the airport. You can walk to and from the airport if you have one bag, although it will be hot and humid. You can take a mini bus for $1.50 as an alternative. A more expensive option would be a taxi from the airport for $15. At check-in, the nice person at the front desk gave me a glass of ice water, which was appreciated. El hotel es un lugar agradable para pasae unos dias en Aruba, esta muy bien ubicado, cerca del centro de la ciudad,Sus precios son asecibles y ofrece un excelente servicio, su personal es amable; Es una ventaja tener el desayuno incluidos y es muy sabroso uno como y se distrae biendo la buena decoración del lugar. sus habitaciones son amplias, limpias y muy bonitas. sinceramente lo recomiendo. No colocan agua en las habitaciones. El hotel es muy agradable y familiar,la piscina es muy limpia.Esta ubicado a 5m del aeropuerto y ciudad en carro y caminando a 15m. Los taxi cobran de 5$a a10$ no pague más. Al frente del hotel se toman los carros por puestos cobran 1,5$. El bar tiene hora feliz los Viernes de 7pm a 9pm, pero cierra a las 11; así que si quiere seguir la rumba debe ir a otro lugar en la ciudad. Por la seguridad no se preocupe la isla es muy segura.